After only living in Aurora for a few short months, Arshad Desai has decided the best way to become involved in his community is to be a part of the change we would like to see become a reality. 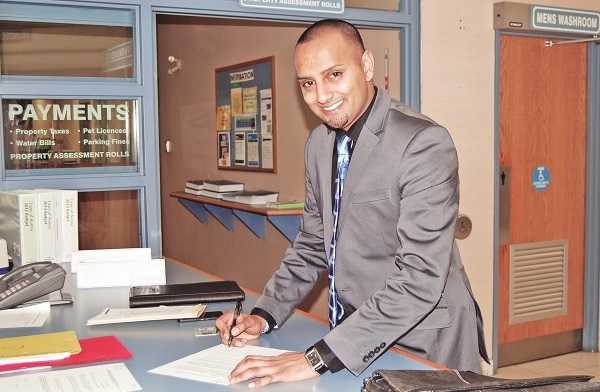 Having moved to Aurora in September, Mr. Desai, who turned 30 on Sunday, says he wants to be truly engaged in a community where his young daughter will be growing up and help grow Aurora from the ground up. Mr. Arshad comes by the desire to become involved in the political sphere honestly. Born in South Africa, he is the son of parents who were very active in the anti-Apartheid movement. Watching his parents in action, “making a significant difference”, he said, gave him a burning desire to become involved as well. Paramount among his goals is to create a better climate for local business. An active member in the Aurora Chamber of Commerce, he says he would like to see programs and supports for young local entrepreneurs, as well as a drive at Town Hall to persuade large scale businesses to set up shop in Aurora. “I went to university at Laurier and one of the biggest things we had in Waterloo was RIM and that was the huge attraction,” he says. “As RIM falls apart, you can watch the Town simply fall apart as well in terms of people having nowhere to work. My desire is to get those big organizations here. He notes it is also important to look at places like Markham and Newmarket to learn from their successes. If elected, one of his top priorities will be to work towards a ward system. Although it is a question which will be on this October’s Municipal ballot, Mr. Desai says he believes a ward system would better representation by population and ensuring residents know who they can turn to as their advocate at the table. With the ward question will also come the matter of reducing Aurora from an eight Councillor system to six. Of this, Mr. Desai says he is less convinced that the community would be better served. “There needs to be more of a focus on Council of working together,” says Mr. Desai, who works as an insurance broker in Newmarket. “I have nothing to say negatively about any Councillor or debate that happens, but [last week’s Council meeting] went until almost midnight and at that point I don’t think people were listening to each other.